MKK and MKR Linear Modules from Bosch Rexroth meet the tougher requirements of modern machine construction. The third generation of MKK and MKR Linear Modules from Tectra Automation, a member of the Hytec Group, and a subsidiary of Bosch Rexroth AG, expands the range of equipment options for the company’s Linear Module series. The ready-to install linear axes are ready to be connected to the one-point lubrication system. In the corrosion resistant versions, hard chrome plated ball screw drives and ball rails ensure a high resistance to chemicals. The Linear Module consists of an anodised aluminium profile body with integrated ball rails and the option of a ball screw drive or a belt drive. Both drive types are provided for in the new generation, in sizes 65, 80 and 110. They are interchangeable with previous versions in the same dimensions and do not require large constructive adjustments. As ready-to-install assemblies, Linear Modules reduce construction and installation effort in all types of machines and systems. Bosch Rexroth addresses the industry-wide trend of automating maintenance work with one-point lubrication systems, thus increasing the life of the axes with a comprehensive lubrication concept. The corresponding components, ball screw drive and runner block, are ready for one-point lubrication with liquid grease or oil. Operators choosing to use their own lubricants can order the corresponding Linear Module components with only corrosion prevention and complete the initial lubrication for start-up themselves. In the standard version, the Linear Module is delivered with initial lubrication making the product ready to use. In applications where increased corrosion resistance is required, the hard chrome-plated ball screw drive, profiled rails, and runner block resist NR can withstand water and aggressive chemicals. Stainless steel band covers with a new magnet profile enhance this resistance and increase the resistance to coolants. Tectra Automation supplies the ball screw drive variant of the Linear Module in lengths up to 5 400 mm. A screw support prevents vibrations at high rotational speeds from 4 000 mm onwards, and thereby increases the application window for highly dynamic or challenging applications. 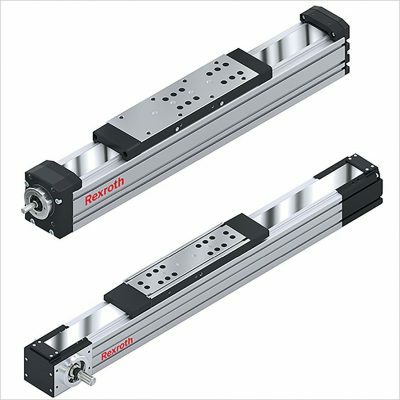 The Linear Modules with belt drive are available in lengths up to 9 400 mm. The absolute measurement system, IMS-A, can be integrated into the modules in sizes 080 and 110. From system start, it captures the exact position of the carriage directly and without a homing cycle. Using the incremental measuring principle, the IMS-A operates wear-free and is resistant to contamination and electric fields. A new switch concept simplifies assembly and saves time. The magnetic field sensors fit directly into the profile frame without additional mounting accessories so that no interfering contours are created. This means that the space-saving design is retained in practice. Two carriages with variable centreline-to-centreline distance also accommodate larger attachments with increased system rigidity. Centring holes in the carriages and frame simplify assembly because the use of centring rings produces a form-fitting connection and thus the adjustment work is substantially simplified.